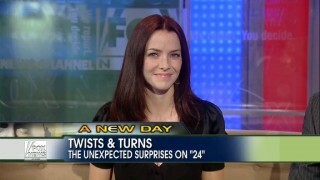 Annie Wersching previews the next season of 24 to FOX and Friends. Sky has a brief chat with Annie Wersching at FOX’s All-Star Party. She discusses the upcoming 24 Season 8 and the changes to her character Renee Walker. Brad Blanks has interviewed Annie Wersching on the red carpet at the 24 Season 8 premiere screening in NYC. Annie Wersching is interviewed by Entertainment Weekly’s Michael Ausiello about Jack Bauer’s love interests (Renee Walker vs. Audrey Raines) and more. Annie Wersching talks about Renee in 24 Season 8. KMOV News 4’s Ray Preston talked with actress Annie Wersching prior to the start of the 2009 Taco Bell All-Star Legends and Celebrity Softball Game on Saturday July 12, 2009. Annie Wersching talks to MLB.com’s Tara Gore in prep for the 2009 Celebrity All-Star game in St. Louis. Annie Wersching talks about the possible love story between Renee and Jack Bauer and teases some interesting things coming up in the 24 Season 7 finale.